Zoo Boise is excited to welcome a new giraffe to the zoo. 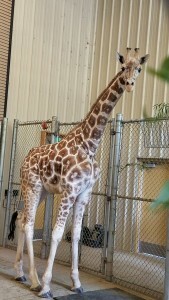 Tafari was safely transported in a customized trailer from the Milwaukee County Zoo and arrived in Boise this weekend. He turned two-years-old on Saturday. Tafari joins eight-year-old giraffe Jabari in Zoo Boise’s African Plains Exhibit. Zoo Boise staff say Tafari is adjusting nicely to his new home and companion. The Boise community raised more than $20,000 in May to bring Tafari to Boise as part of Idaho Gives Day. Nearly 300 donors supported the project to bring another giraffe to Boise. Lower seasonal temperatures made it safe for Tafari’s transport to Boise from Milwaukee last week. Zoo Boise, located in Julia Davis Park, is a division of the City of Boise Parks & Recreation Department. The zoo invites the community to Keep Your World Wild; the zoo turns the act of visiting the zoo into a conservation action. Zoo Boise is accredited by the Association of Zoos & Aquariums, a national organization that supports excellence in animal care, conservation, education and science. For more information, see www.zooboise.org or call 208-608-7760.